Care for your skin with the Mio Skincare Shower Essentials Duo. Combining a refreshing shower gel and a gentle exfoliator, the duo contribute towards a pleasurable shower experience, leaving skin hydrated and nourished. Awaken skin with the Quick Start Exhilarating Shower Gel. Without stripping skin of essential moisture, the shower gel delivers Coconut-derived cleansers, fresh Spearmint and an incredible blend of essential oils and extracts, including Mentha Arvensis Leaf Oil, Citrus Lemon Peel Oil and Cypress Leaf Oil to help ease and relax muscles. Guarana-derived caffeine gives the shower gel a reviving effect, leaving skin refreshed. The Double Buff Enzyme Exfoliator polishes your skin without the use of any rough beads; Pumice, Lava and Bamboo blended with Papaya and Pineapple enzymes do all the work efficiently and gently. The formula gives the appearance of even skin tone and helps to reveal a new, soft layer of skin that is ready to glow. Also suitable for use on your face and perfect for priming your skin before applying self-tan. Shower Gel: Apply to damp skin all over. Rinse off. Use liberally and often. Exfoliator: Use at least twice weekly. Massage into DRY skin before showering off. Double Buff is super easy to use. Feel free to use on your wet face too - you don't want your face feeling jealous of your lovely legs! 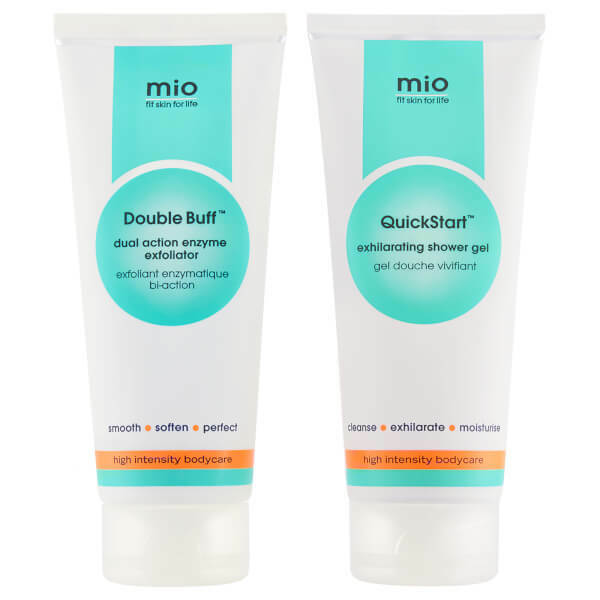 Double Buff is the perfect skin prep for any of our Mio Firming Faves or Moisturising Miracles. Shower Gel: Aqua (Water), Aloe Barbadensis (Aloe Vera) Leaf Juice, Cocamidopropyl Betaine, Sodium Cocoyl Isethionate, Sodium Lauroamphoacetate, Lauryl Glucoside, Sodium Lauryl Glucose Carboxylate, Sodium Methyl Cocoyl Taurate, Polyquaternium-7, Cocamide MEA, Acrylates Copolymer, Coco-Glucoside, Glyceryl Oleate, Parfum (Fragrance)*, Polysorbate 20, Caprylhydroxamic Acid, Glycerin, Panthenol (Vitamin B5), Caprylhydroxamic Acid, Citrus Limon (Lemon) Peel Oil, Sodium PCA, Glyceryl Caprylate, Citrus Grandis (Grapefruit) Fruit Extract, Citrus Limon (Lemon) Peel Extract, Hamamelis Virginiana (Witch Hazel) Leaf Extract, Mentha Viridis (Spearmint) Leaf Oil, Menthol, Paullinia Cupana (Guarana) Seed Extract, Mentha Arvensis (Wild Mint) Leaf Oil, Lavandula Hybrida (Lavandin) Oil, Cupressus Sempervirens (Cypress) Oil, Cistus Ladaniferus (Rockrose) Oil, Limonene, Linalool. *Blend of essential oils. Shower Gel: 200ml / Exfoliator: 150ml.